A beautiful piece of grilled salmon on a slider bun topped with garden fresh lettuce, bacon, garden tomato and a smear of pesto. Bacon Tomato Pesto Grilled Salmon Sliders showcase Summer at it’s best. It’s a shame I wasn’t more thoughtful in my styling efforts with this photo, because hidden in this Salmon Slider is a beautiful bright red slice of tomato from my garden, glorious in all it’s flavor. We had snow in May, I was lazy over Memorial Day, and didn’t get my tomatoes planted until the first weekend in June. Aside from my one early production Patio Tomato here at the house, my Early Girls, Big Boys and Celebrity Tomato plants from my community garden plot are just starting to come in. And, my oh my, is this a good year for flavor. Every year, our tradition is to make a bacon, lettuce, tomato sandwich with the first tomato. Which we did. And why not Salmon BLTs? With a little Homemade Basil Pesto for some excitement. When I announced that it was Salmon Sliders for Salmon Saturday hubs turned up his nose. But as always a slice of bacon will save the day. With no fancy seasonings for the salmon, no exotic aioli, these simple sliders turned out to be really good. I roasted two salmon filets that were seasoned with salt and pepper and when cooked until flaky and tender simply cut the thick parts of the filets into chunks that would fit on the slider bun. To build the sandwich, a smear of mayo, a smear of Homemade Basil Pesto on the bottom bun, then the salmon, next up a slice of cooked bacon that had been cut in half to fit, a slice of tomato and lettuce and dinner was ready. The side dish was simply sweet new potatoes that I had purchased at the Farmer’s Market that had been par-boiled then sliced in half and sautéed in olive oil with sliced green peppers and sliced onions. A fresh and delicious meal. Last Summer I wrote about my friend Heather and her garden plot at the Highlands Ranch Community Garden. This year, tragically our friend Darcy has been ill with Cancer and couldn’t tend her space at the same Community Garden. Heather asked if I wanted to share Darcy’s space with her and I jumped on board. I’ve planted 8 tomato plants, some various chile peppers, cucumbers and spaghetti squash. Join me for a little tour. The community garden is only about 10 blocks from our house, making it very convenient to tend and visit. From the parking lot, it’s a short walk along Marcy Gulch Trail. The garden is strictly organic. There are probably 40 garden sections and the cost is $40 per year. I wouldn’t call it Fort Knox, but the garden area is fenced and the lower half of that fence is covered in chicken wire to keep the rabbits out. A padlock combination is required to get through the gate. My one and only cucumber plant has done very well. I’ve probably picked at least a dozen cucumbers like this and it’s still going strong with lots of new blooms. I planted one spaghetti squash plant and have about 6 squash. They’ll have to get more yellow before I pick one. The garden next to ours has a couple of Sunflower plants. As soon as seeds developed, every visit we’ve watched this male Goldfinch feeding. He has to stand on his head to get to the seeds. Success! Eating the seed before he dives back in for more. Salmon Sliders…It’s What’s for Salmon Saturday. This looks delicious, as I sit here waiting to hear if my husband has caught “the big one” on the Klamath River. I’m sure hoping for a great day of fishing. And, am loving your garden pics 🙂 Thanks! I think community gardens are such a good idea for urban areas and I can tell you are glad you participated. Really like your goldfinch shots. Thanks Larry. I’m really enjoying it, and nice that it’s so close to home. I got so wrapped up on your garden that I forgot to say how good the slider looks. 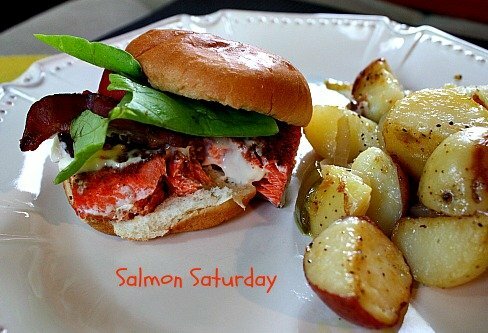 Love your salmon saturdays! I need to plant sunflowers! I have so many bird feeders that they automatically come up in my yard every year. The birds plant them for me. What a great shot of the goldfinch Lea Ann. Looks like he’s enjoying your garden plot. I’m ready for tomatoes any day and tomatoes on sliders would only make it better. In a few days I’m going to be knee deep in tomatoes. My plants are really doing well. Lea Ann, I always have to laugh at your husbands responses to what you are making! 🙂 I am too, always aiming to please my husbands palate. Seems like they always like the end result-even with any eye rolling. Your garden looks lovely-good job! Thanks what I do Vickie, is pick them and lay them out for the birds. I’m really enjoying the garden. Hope I get to participate next year. That is such a cool garden, even with the super tight security lol. Super tight is right Chris. I was down there yesterday and the lock was rusted open. do you have a recipe for your bacon, tomato, pesto, grilled salmon slider? be cool my friend – and thanks for all you do so we can eat luscious food!